Review Summary: Unfocused but with strong performances. 'Jai Gangaajal' does not match the power or impact of the original film. So on an overall basis, ‘Jai Gangaajal’ is not a bad film and has some enjoyable scenes to cherish. Sadly, the repetitive screenplay, half-baked characters and dragging length of the film dilutes the film. The movie lacks the pureness of ‘Gangaajal’ and ends up being a sloppy water. But if you go in without too many expectations, you might find parts of its fairly palatable. Minister Chowdhary also has a lot to gain from this transfer of land. So the movie is pretty much weak in every aspect compared to its predecessor. A weak plot. A weak narration. A weak casting and A weak technical team. So on the whole, the movie is a failure. Try to save your bucks by avoiding this movie. There's much maara-mari, draamebazi before the film culminates the way you expected it to. From a Prakash Jha, much was expected. Priyanka Chopra’s cop drama is GRIPPING in parts! Priyanka Chopra and Prakash Jha pitch in diverting performances in this gritty cop drama! There are memorable dialogues - 'Aapko galat misguide kiya jar raha hai' - and sharp editing. At the end of the day, Priyanka Chopra's Abha Mathur does offer a role model to many, but the reality too is too clear: A happy ending is but make-believe in the hinterlands of the country. Watch Jai Gangaajal for Priyanka Chopra. If you are a Chopra fan and would love to see her kick bad guys into submission, then give this film a shot. Otherwise, skip it. “Jai Gangaajal” is another one of those countless police dramas Bollywood churned out in the 80s, with a gender role reversal that is cosmetic at best. The movie is not worth a shot, unless you are a crazy PeeCee fan and are wanting to see her in a new avatar. And it is for the performance of the actors that the film may be watched. Prakash Jha knows his work very well !! 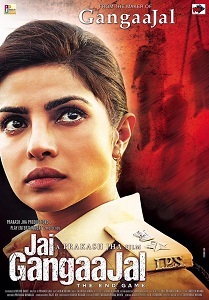 “Jai Gangaajal” is a must watched film for the Priyanka Chopra’s fans as PC gives dazzling performances in the movie. The story is quite predictable. The overdosed screenplay makes it more irritating than actually it is. The music and the background score have been good enough and the cinematography has been apt. The production values have been lavish enough, but Prakash Jha, who has been an expert in narrating the social issues well, this time gives a huge thumbs down. Poor villagers running around and open gypsies trailing them has become a trademark of Prakash Jha’s filmmaking. The plot of "Jai Gangaajal" is predictable but the hard-hitting action drama has some really powerful and engaging scenes that keep you glued to the silverscreen till the very end. The film has a decent subject; however, Jha seemed focusing more on the character making her image larger than life and soon seen suffering the film with content discontent.